Providing you the best range of mobile application development service, iphone application development service and android application development services with effective & timely delivery. Leveraging on our vast industry understanding and knowledge, we are engaged in providing Mobile Application Development Service. Our team at Gharuda Infotech Private Limited is dedicated and has done lots of research in the field of making a stabilized Mobile App. This Mobile Application Development Service is rendered exactly as per the clients give the specifications in order to fulfil their every needs and expectation. They are thus able to propose the best ways of app implementation in accordance with your business needs and expectations. Our organization is highly trusted in offering iPhone Application Development Service to our clients. Ever since the introduction of Apple's first generation iPhone in 2007 to the market, user behaviour has changed significantly. We offer an end-to-end iPhone application development service. We're here to help your business develop the apps to stay ahead of your competition. We ensure that our team consists of highly experienced app developers that provide instant support and communication. We are engaged in offering the Excellent Quality Android Application Development Service at a highly competitive price to our esteemed Clients. Our Application Development solutions approach includes agile methodology and incremental delivery of software. 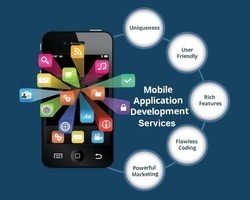 We ensure our clients that the final app developed matches their business requirements and objectives. We provide services to develop quality Android apps at the affordable cost. We provide Standardized Execution Process, Output of Consistent Quality, Reliable and Flexible.